After twenty five years in the printing industry, and seven years as the assistant editor for a small outdoor newspaper, Jo Schaper now earns her living by writing, editing, doing desktop publishing, website design and in-home residential computer help, the latter for seniors in Franklin and St. Louis counties. With bachelor's degrees in writing and geology, a tech certificate in offset printing, classes and proficiency on both the PC and Apple platforms, Geo Communications Services was founded in 2003 to bring together her writing and print expertise with her computer skills, which began when she taught herself programming in her late teens on an Apple II+ in 1979. A stint in a T-shirt shop sharpened her computer graphics skills. 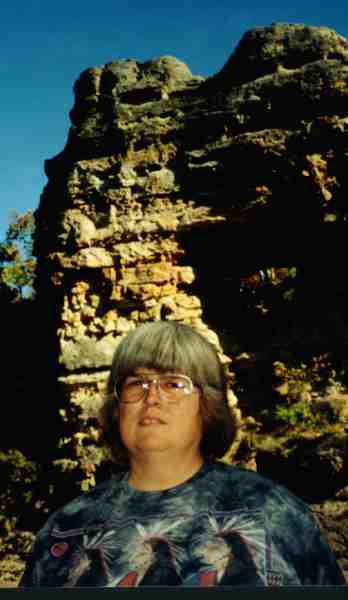 Shortly thereafter she published her first website in 1996, Jo Schaper's Missouri World, where she explains geology and hydrology to laymen and students in plain English. She found a niche in the home computer field, providing computer and communications services to small businesses and individuals long before there was a "Geek Squad." She continued running Geo Communications Services on the side while serving as assistant editor for the River Hills Traveler from 2007-2014. Since 1998 she has written a geology column for The Outdoor Guide, a sportsmen's newspaper. Her publication credits include The River Hills Traveler, the St. Louis Labor Tribune, Missouri Life, The Missouri Conservationist and The Kaleidoscope Weekly. She has authored two scientific issues of Missouri Speleology, articles in the NSS News, and wrote monthly for 5 years for The Meramec Caver. Jo has presented geology, history, bat and miscellaneous programs for Missouri's state parks, Elderhostel senior seminars, the St. Louis Science Center, the Bonebrake Center, and led geology tour busses down Ozark gravel roads. She is married and has a filing cabinet full of poems. She and her husband Eugene spend as much time away from big cities as life permits. I like to hear from folks! Please send any additions, corrections, or comments to joschaper@socket.net.